The following is the text of an IBM Data Processing Division press technical fact sheet distributed on August 19, 1965. IBM System/360 Model 44 draws its special talent for scientific computing from a combination of fast parallel binary operations; short-, long-, and variable-length precision floating point arithmetic; and its FORTRAN programming support. The speed and power of the Model 44 are evidenced in its one microsecond memory access time and its 32 data bit word parallel arithmetic and data paths. Also, the Model 44 has 16 general-purpose registers in which calculations can be handled at microsecond speeds or implemented in optional 250-nanosecond Solid Logic Technology circuits. Integrated single disk storage drive - A permanent disk storage unit with an interchangeable cartridge is built into the Model 44's central processing unit. It provides high-performance low-cost storage for programs and data enroute to or from input/output devices. The unit houses 272,000 words (32 data bits, 4 parity bits), or 1,088,000 characters (8 data bits, 1 parity bit). Its transfer rate is 90,000 characters a second. The average time to locate information at any point in the file is 70 milliseconds. An additional optional disk drive is also available. Short/long precision, floating-point arithmetic feature with variable-length long precision - In floating point arithmetic, in which a computer looks at large numbers in the way scientists often do - - utilizing 3.6 x 108 to represent 360,000,000 - - the System/360 Model 44 offers the option of using the entire number or rounding it off at variable limits in order to gain speed. The floating point feature provides arithmetic precision of from six digits (short precision) to more than 15 digits (long precision) in a range of from 10-78 to 10+75. Short precision addition or subtraction takes 3.81 microseconds; long precision takes 6.32 microseconds. Operations are executed in any of four 64-bit floating point registers. An addition or subtraction in fixed-point arithmetic, performed in the optional high-speed general registers of the Model 44, takes 1.75 microseconds. These 16 registers are used as index and base registers, as accumulators for fixed point arithmetic, and for logical operations. All transfers of data are checked by the parity bit assigned to each character unit. The 32-bit words carry four parity bits. The flow of information between Model 44's processor and its input/output equipment is directed by multiplexer channels. Three in total can be attached: one standard speed and two high speed. These channels, essentially subdivide themselves into a network of sub-channels, setting up a two-way flow of data between the processor and input/output devices. The standard speed channel, handling up to 64 such devices as printers, card units and communication terminals, operates at 50,000 characters per second in the multiplex mode. The high-speed channel, which can address up to 64 devices such as tapes, disks and data acquisition units, operates at 200,000 characters a second. In the burst mode, with a single device capturing the entire multiplexer channel, the rates between the two channels vary from 200,000 characters to 500,000 characters a second. the IBM 1800 data acquisition and control system which combines to form a high-speed system for handling such jobs as missile telemetry and nuclear reactor control. The 1800 records and measures information in a hurry (it will gather eight million bits a second). The Model 44 adds high-speed scientific computing power to the system. the IBM graphic system which takes advantage of the power of the computer for handling graphic information on such jobs as computer-aided design and the reduction of electrocardiograms into digital form for computer processing. 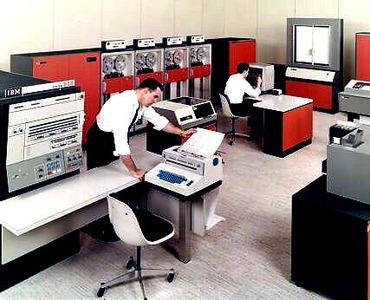 IBM System/360 Models 30, 40, 50, 65 and 75 for fast, efficient data handling and computing. input/output devices specifically chosen for the scientific user including data storage devices and visual display units. Model 44 is both well suited as an instrument of research for scientific use and is compatible with other models in IBM's System/360 line. Normally, the Model 44 uses an abridged set of System/360 instructions -- those associated with scientific operations. It can, however, with the addition of an Extended Instruction Set capability run programs interchangeably with Models 30, 40, 50, 65 and 75 if system configurations (memory capacity and peripheral devices) are comparable and the problem programs not time dependent. Model 44 programs can - - in turn - - be run on other System/360s, through the Single Disk Storage Drive which contains Model 44 programming and which is available for Models 30, 40, 50, 65 and 75.
a series of over 100 scientific subroutines - - instructions to the computer for solving countless numbers of problems common to science and industry - - contained in an application program entitled System/360 Scientific Subroutine Package. The languages used in these programs are the Model 44 instruction set terminology and FORTRAN - - the standard scientific computing language. an interval timer which is used for such things as job accounting to interrupt and prevent a runaway job from gaining control of the system.